A 70-calorie snack with 6 grams of protein. Photo courtesy American Egg Board. Have you awakened with a New Year’s resolution to eat healthier? Snack on hard-cooked eggs. Most people call them hard-boiled eggs, but the proper term is hard-cooked: The eggs are not boiled. After the water comes to a boil, the eggs are removed from the stove to cook in the water. But boiled or hard-cooked, January is National Egg Month. According to the American Egg Board, one large egg contains about 70 calories and 6 grams of protein, 12.6% of the Daily Reference Value (DRV) for protein. Eggs are an all-natural food that are packed with nutrients. One egg has 13 essential vitamins, unsaturated fats, antioxidants and high-quality protein—all for 70 calories. Egg protein is the highest quality protein of any food. One egg, any size, is equal to one ounce of lean meat, poultry, fish or seafood. High-quality proteins are foods that are high in protein and low in saturated fat. They provide all the essential amino acids the body needs to function properly and to develop, build and maintain muscles. Animal proteins such as lean pork, skinless poultry, lowfat and nonfat dairy products and eggs are examples. Beyond weight management, egg nutrients help with muscle strength, brain function, eye health and a healthy pregnancy. Every Sunday, hard-cook a dozen eggs. You can leave them in the shell or peel the entire dozen and keep them in an airtight container. If you leave them in the shell, you should still put the eggs in an airtight container (or in a bowl covered tightly with plastic wrap), since the shells are very porous and will absorb refrigerator odors. Here’s how to make perfect eggs. 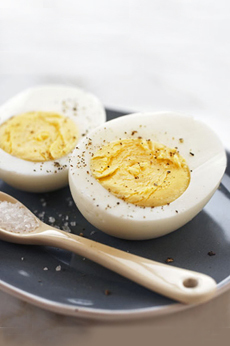 Enjoy an egg for a quick snack at home, or take one on the road. Cooked eggs are delicious as is, but you can bring packets of salt, pepper, mustard, soy sauce or other condiments. In the office, we enjoy our egg snack with a bit of Dijon mustard, fresh-cracked pepper, hot sauce or salsa. Instead of grabbing a snack with empty carbs, too much fat, sugar and/or sodium, you’ll have made an eggcellent choice. What about eggs and cholesterol? If you have high cholesterol, discuss how many you can eat with your healthcare provider. Everybody else: enjoy and read these egg cholesterol facts.